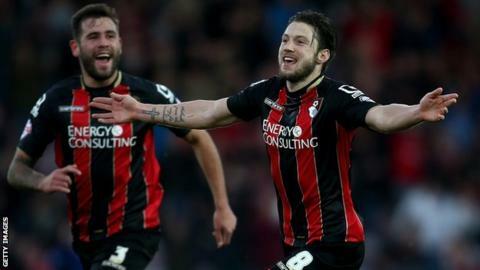 Championship leaders Bournemouth saw off resurgent Fulham to extend their unbeaten league run to 13 games. Brett Pitman put the Cherries ahead on his 250th Football League appearance, heading in Matt Ritchie's corner. Pitman then had a penalty saved by keeper Marcus Bettinelli after Jack Grimmer fouled Callum Wilson. Fulham rarely threatened Artur Boruc's goal, but Seko Fofana and Scott Parker went close before Harry Arter drove in Bournemouth's second in stoppage time. While Eddie Howe's side never threatened to repeat their 6-1 demolition of Blackpool, the win was sufficient to reclaim the top spot they vacated briefly when Ipswich beat Brentford in the early kick-off. Ritchie's delivery from an early corner was inch-perfect for Pitman, who stole in at the near post to deftly head past Bettinelli. Despite driving rain and bitter cold, both sides remained committed to the passing game. But while Bournemouth kept Bettinelli busy, the visitors' neat build-up play rarely translated into clear chances. Ross McCormack roused Fulham spirits with a dangerous cross which missed everyone before Grimmer's push on Wilson earned Bournemouth's spot-kick, but Bettinelli again saved Fulham as he parried Pitman's low effort. Fofana then curled a shot wide, while McCormack set up captain Parker, whose low drive was pushed wide for a corner. As time ran out, Bournemouth looked more likely to score, as the lively Ritchie fed Marc Pugh, who was foiled by Bettinelli. And after Cottagers substitute George Williams was booked for diving, Arter sealed proceedings from the edge of the area with a shot which his brother-in-law Parker narrowly failed to charge down. Bournemouth boss Eddie Howe: "The challenge for us now going forward is to stay at the top of the table. Everyone wants to knock us off. "We are a scalp now. We faced that situation in the past couple of weeks now. We're a lot more well known now, so the element of surprise has gone. "But we were always going to have to cross that bridge and the players are going to come under more pressure now in different ways." Fulham manager Kit Symons: "We said at half-time we'd weathered the storm a little bit. We had some opportunities, but it wasn't quite to be. "We rode our luck at times, but we had to be brave and take the game to Bournemouth and I thought we did that in the second period." Match ends, Bournemouth 2, Fulham 0. Second Half ends, Bournemouth 2, Fulham 0. Attempt missed. Harry Arter (Bournemouth) left footed shot from the centre of the box is just a bit too high. Assisted by Adam Smith. Substitution, Bournemouth. Yann Kermorgant replaces Callum Wilson. Goal! Bournemouth 2, Fulham 0. Harry Arter (Bournemouth) left footed shot from outside the box to the bottom right corner. Dan Gosling (Bournemouth) is shown the yellow card. George Williams (Fulham) is shown the yellow card. George Williams (Fulham) has gone down, but that's a dive. Substitution, Fulham. Cauley Woodrow replaces Hugo Rodallega. Attempt saved. Marc Pugh (Bournemouth) right footed shot from the centre of the box is saved in the centre of the goal. Assisted by Matt Ritchie with a cross. Substitution, Bournemouth. Dan Gosling replaces Brett Pitman. Attempt missed. Matt Ritchie (Bournemouth) left footed shot from the right side of the box misses to the left. Assisted by Brett Pitman following a corner. Corner, Bournemouth. Conceded by Konstantinos Stafylidis. Nikolay Bodurov (Fulham) wins a free kick in the defensive half. Brett Pitman (Bournemouth) is shown the yellow card for a bad foul. Marcus Bettinelli (Fulham) wins a free kick in the defensive half. Attempt saved. Matt Ritchie (Bournemouth) left footed shot from outside the box is saved in the centre of the goal. Attempt blocked. Harry Arter (Bournemouth) right footed shot from outside the box is blocked. Assisted by Marc Pugh. Substitution, Fulham. Patrick Roberts replaces Bryan Ruiz. Offside, Bournemouth. Brett Pitman tries a through ball, but Callum Wilson is caught offside. Shaun Hutchinson (Fulham) wins a free kick in the defensive half. Attempt missed. Brett Pitman (Bournemouth) header from the centre of the box misses to the left. Assisted by Simon Francis with a cross. Corner, Bournemouth. Conceded by George Williams. Substitution, Fulham. George Williams replaces Lasse Vigen Christensen. Foul by Bryan Ruiz (Fulham).